In a month during which reading proved to be a slow, at times disjointed enterprise, I feel it would be shortsighted to let January come to a close without calling attention to one of the simplest, most precious reading experiences I enjoyed over the past 31 days. It arrived, courtesy of the translator, on a morning when I was rushing out of the house on my way to an appointment across town. A slender, pocket sized volume, it proved perfect company for a busy day. Only 40 pages long I read it several times before the week was out. I am speaking of Peter Handke’s poetic meditation To Duration, translated from the German by Scott Abbott. on the way home before dawn after love. This duration, what was it? Was it an interval of time? 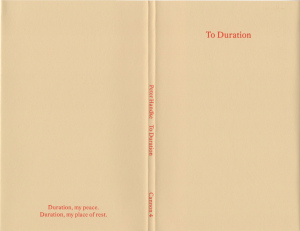 Duration, Handke tells us, is not fixed or prescribed; it cannot be scheduled or delayed. It can be approached, but it cannot be forced or guaranteed. I would wager that as our lives grow more stretched, weary, and fraught with the disillusion of time, duration becomes ever more elusive. I also wonder if, when we try to grasp at it through our memory of those moments when it seems we once met duration in passing, the more impossible it seems. And then, one day, when we are not expecting it, the feeling taps us on the shoulder, washes over us and moves on but leaves its trace, like frost on a bare branch or the hint of dew on the grass. One of the true gifts of this book, is that it inspires the reader to explore his or her own experience of duration. What is it for me,when is it, when was it, where? These are the questions that the reader is encouraged to meditate upon, as Handke reflects back upon his relationship with duration in his own life. His calm, measured, and sensitive introspection invites you to engage in the same. At one point he talks about travel and journey as opportunities to open oneself to encounters with this feeling. There was a time when I was able to regularly visit certain parks and pathways in my hometown, typically with my camera in hand, focused on nature framed through the lens – a dried leaf here, a glimpse of a meandering stream there, the shifting pattern of clouds in the wide blue sky. At home, processing the files, I could almost revisit the moment – it was not the photograph that fixed the moment, in and of itself, it was rather an ability of the image to contain, for me alone, the experience of being in the moment. Is that duration? A variation on the theme? And why don’t I visit local parks as much as I used to? In truth, I need a greater distance, at least right now. Last summer I spent three weeks in South Africa. After a visit with a close friend in the Eastern Cape, I returned to Cape Town for a week on my own. I traveled on foot and by city bus, eschewing most of the tourist sites. I wanted to be in the city. 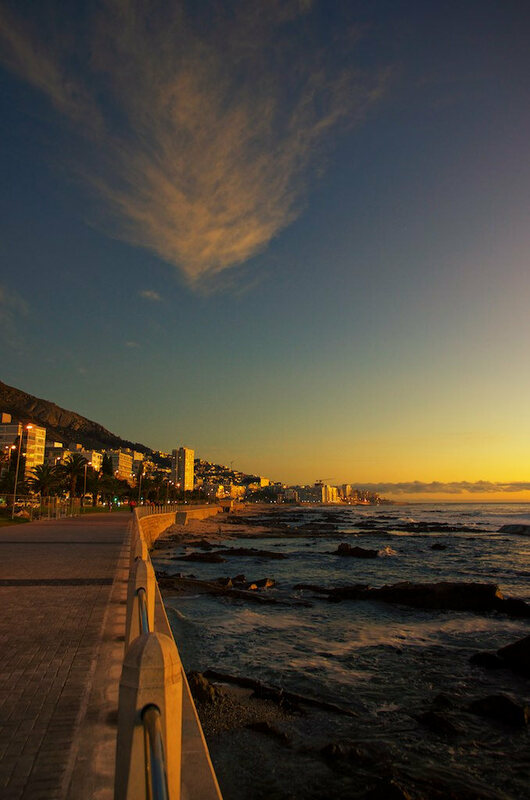 I stayed in a small B&B in Sea Point and every day I walked the Promenade along the Atlantic. A popular pathway, no doubt, but there was, for me, an essential necessity to be close to the ocean. Sometimes I would stand at the salt-corroded railings and look out over the waves and find a deep peace at being so far from home and all of the complications left behind there. I could turn around and ground myself with the unmistakable landmarks of Signal Hill and Lion’s Head. It was the moment experienced and re-experienced each day that became the fulcrum of my stay in the city. No day was complete without it. If I lived in Cape Town I don’t think I could have touched duration like that, so intentionally. The measure of seven short days, coloured by an intention to be less a tourist than a presence in a city, not having to actually attempt to fit in like I do at home, I touched a peace of place I rarely experience. Travel can do that. is that really still necessary for me? Handke acknowledges increasingly finding more instances of duration closer to home, even in his own garden. Restless as I am in my house and home, I likely frighten off duration, so fragile and fleeting a guest. Yet just the other night it caught me unaware. My elderly father, still seriously weakened and disoriented following his stroke, insisted on returning home from the hospital on Thursday against the recommendations of his doctors and the wishes of his family. I quickly gathered some clothing and personal items in one bag and tossed a handful of books from my priority pile into another and headed out the door for the two hour drive to the remote location where they live. That first evening, once my exhausted parents were safely tucked into bed, I sat in the delicious silence with my collection of books. I wasn’t actually expecting to have time to even start reading any of them – I just wanted to spend time with these relatively new acquisitions. Get to know them a little. Read a few pages. This unexpected moment, borne of a collision of unwelcome circumstances, opened the door to duration, inviting that unpredictable, immeasurable sensation, to wash over me, leaving a sense of contentment I hardly imagined I would encounter when I had headed for the highway only a few short hours earlier. Perhaps then, if you watch for it, open yourself to it, maybe duration is not quite as elusive as it may seem. To Duration, Cannon Magazine No. 4, is published by The Last Books. With infinite thanks to Scott Abbot. Beautifully meditated and written. Sounds like a gem of a book as well. It is a lovely little book, a perfect companion for a walk or a journey or a quiet afternoon. I was very moved by this book but unable to write anything about it. There is a quality to Handke’s work, like Beckett’s that I find near impossible to capture in mere language. What you’ve written is also moving and powerful. I really hadn’t thought I would write about this book, although in truth I could write so much more. This came to me on my drive home yesterday, a perfect space for reflection, being in transit and yet freed for the moment from the stresses that lie at either end of the journey these days. “…coloured by an intention to be less a tourist than a presence in a city, not having to actually attempt to fit in like I do at home, I touched a peace of place I rarely experience. Travel can do that.” – couldn’t have put it better. Travel is such a multi-layered experience. It heightens the senses. My stay in Cape Town is particularly poignant and, at the same time, a double edged sword. It is one of the mot breathtakingly beautiful cities I have ever visited, yet one of the ugliest places – embodied in some of its most beautiful people (and the deep seated racism that still exists there). I remember you saying something on those lines when we first ‘met’. I think you were freshly back from your Cape Town visit. Racism exists everywhere; that’s what I have come to conclude. The facades and degree may vary according to geography and culture, but the prejudice at the core remains. And so many books to read! Another beautiful piece of writing, Joe. Your sharing personal experiences made me understand his idea of duration on a deeper level. My idea intersects with his I supposed, it is that feeling you know but struggle to capture adequately. The reviews of books I most love are the ones that reveal why the book mattered to the reader. Your personal reflections sparked by your reading are wonderful. Thank you. I suppose a book like this deserves a reflection rather than a review, a tribute in fact to the quality of your translation. Reading has been slow while two of the books I have read will see reviews elsewhere, one soon, the other hopefully March if I get it done. I will of course link back to them. The first, for On the Edge by Rafael Chirbes should go live in the next week to 10 days. Awesome book I am sure you will like as much as I did. Otherwise I am making trips between my home and my parents. That is between an alcoholic adult child at one end and an incorrigible 87 year old stroke survivor ( my dad) who has checked himself out of the hospital long before it was safe or he was ready!! No novel, gathering essay material out of real life though!!! What a lovely book. I enjoyed your meditation immensely. I think the key is definitely being open and present to the moment. I tends to happen to me most often when I am outdoors and it is never expected but always welcome. Thanks Stefanie. I think you’re right about keeping open to the moments that we encounter. Many thanks for your thoughts on this poetry and sharing your South African experience and, your time with your parents. This is a beautiful post.